I think an important part of being a prognosticator/advice giver is being open about your accuracy. We aren't future tellers and, therefore, we will not get every prediction correct. 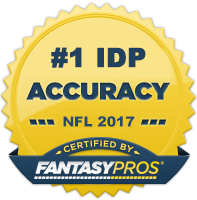 However, a good IDP prognosticator should be right more than they are wrong, otherwise what's the point? After calculating this week's total points, I finished with a score of +2 (6 positives, 4 negatives, 2 neutrals). I consider this a fairly solid week. To think of it another way, I was correct on 60% of my predictions. When looking within each position, it was easy to see that I had a very high success rate with LB's and DB's. However, the success rate for DL wasn't what I expected. Moving forward to next week, I will put more of my research time into the DL position.